Before even releasing their first album, U.K.-bred four-piece The Struts opened for The Rolling Stones in front of a crowd of 80,000 in Paris, got hand-picked by Mötley Crüe to serve as the supporting act for their four last-ever performances, and toured the U.S. on a string of sold-out shows that demanded the band move up to bigger venues to accommodate their fast-growing fanbase. Now with their full-length debut Everybody Wants, lead vocalist Luke Spiller, guitarist Adam Slack, bassist Jed Elliott, and drummer Gethin Davies reveal the supreme mix of massive riffs and powerfully catchy melodies that’s already slain so many adoring audiences around the globe. At the core of Everybody Wants are power-chord-driven tracks like the hard-charging album-opener “Roll Up” (a “larger-than-life caricature of the person I am onstage, very glamorous and very cheeky,” according to Spiller) and the gritty-yet-exhilarating “Kiss This” (a breakup song whose “message is really about standing up for yourself—sort of our version of a ‘Young Hearts Run Free’-type song, but in a rock mentality,” Spiller notes). With its hip-shaking rhythms and euphoric harmonies, “Times Are Changin’” recaps the band’s recent glories (“I’ve been to New York City, I met the Rolling Stones”), while “The Ol’ Switcharoo” blends bubblegum melodies and horn-backed grooves into the world’s most irresistibly fun tribute to girlfriend-swapping. Largely on the strength of their dynamic live performance, the Struts fast built up a major following and started selling out shows all across Europe. Along with landing the Stade de France gig with the Rolling Stones, the band took the stage at the 2014 Isle of Wight Festival, with Spiller decked out in a shimmering-blue cape custom-made for him by Zandra Rhodes (the legendary designer who formerly created costumes for Queen’s Freddie Mercury and Brian May). 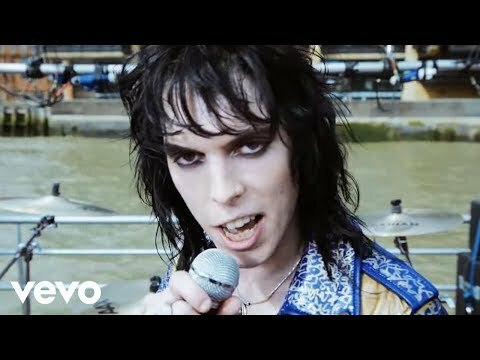 Over the past few years Spiller’s role as a style idol has prevailed, with the New York Times recently spotlighting the singer in a fashion-centric feature and Ray Brown (an Australian designer who’s also dreamed up outfits for AC/DC, Ozzy Osbourne, and Lady Gaga) coming up with costumes for The Struts’ run of dates with Mötley Crüe. In their lavish stage presence and magnetic appeal, The Struts have more than demonstrated a preternatural command of monumental crowds. But while all that glitz and flash never fail to thrill, the band’s impassioned music and high-powered spirit also fulfill a far greater purpose. “The main mission of the band is to bring back that feeling of fun and rock & roll, especially to all those people who are bored by what’s going on these days,” says Spiller. “We really believe that music, when it’s done right, can help you escape the present moment, and then just send you somewhere else entirely." Live photos by Maggie Koo and Katrine Jung.